Feng Wang analyses Chinese commitment to Climate Change. What does China’s Climate Change target mean? Feng Wang is a Chinese student who is enrolled in graduate study on environmental economics and carbon management at the Illinois Institute of Technology. As part of the coverage on COP15, TOC will be featuring opinions from all over the world on Climate Change. On mitigating Climate Change, the Chinese government has offered a reduction of CO2 intensity per unit GDP by 40-45% from the 2005 level by 2020. Although many climate experts are unhappy with this “soft” effort, the promised reduction is actually a realistic goal for China and other developing countries in similar situations. Why? I think the answer lies on the growth characteristics of Chinese economy. No matter how big the national economy, China is a developing country; it has to develop its economy in order to meet the demand of their people’s pursuit on lifting living standards at least for fifty years. It is not from the benevolence of the butcher, the brewer, or the baker that we expect our dinner, but from their regard to their own self-interest. We address ourselves, not to their humanity but to their self-love, and never talk to them of our own necessities but of their advantages. Hence, it is for the best interest of Chinese people to prioritise economic growth in the nation’s development strategy. This pursuit is not so-called growth mania. On the contrary, it is for the amenity of the 1.3 billion strong population in China. However, as China is not the only country in this world, the Chinese pursuit of prosperity and happiness cannot be done at the expense of other people and other nations. 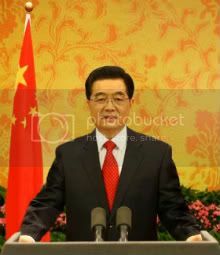 China has to follow a principle of development which is accepted by the majority of nations and races in this globe. The Chinese government is constrained by the limited supply of natural resources while it has to address the growing demand on these resources due to population boom. The most urgent problem is thus how to improve the efficiency of utilising these natural resources in order to reach the equilibrium between meeting people’s demand on the lift of living standards and making our living environment as sustainable as we could. The reduction on CO2 intensity per GDP unit is exactly an effective approach to address this problem. 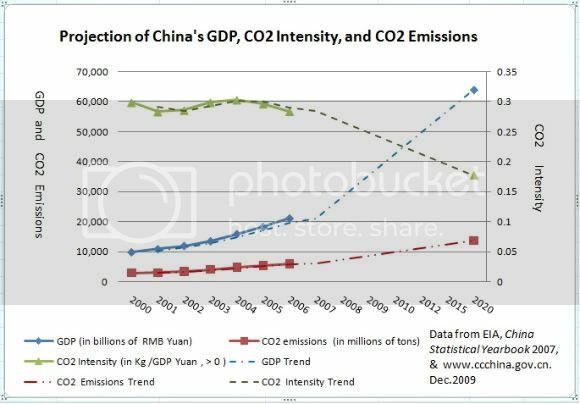 The following chart depicts past trajectories of China’s GDP, CO2 intensity, and CO2 emissions from 2000 to 2006, and also projects their trends up to 2020. As projected in the chart, China’s CO2 emissions will reach 13,718 million tons in 2020 if the goal of CO2 intensity per GDP Yuan is achieved. As a result, this effort on reducing CO2 emissions in China will avoid roughly 9,000 million tons of CO2 emitted into atmosphere in 2020 when compared to the emission under the scenario of keep Status Quo. Detailed information and reasoning can be found in the following explanation and assumptions. Explanation on the source of data: All data for Chinese carbon dioxide emissions are retrieved from Energy Information Administration (EIA) of Department of Energy (DOE), United States of America. The data on Chinese GDP from 2000 to 2006 is retrieved from China Statistical Yearbook 2007. The Chinese reduction target on Climate Change is published on China Climate Change Info-net, which is directly under the supervision of National Leading Committee on Climate Change, China. According to the reduction target on CO2 intensity by 2020 on 2005 level, there will be a 40 to 45 percent decrease on CO2 intensity per GDP Yuan in 2020. Therefore, take the lower end at 40 percent reduction, the CO2 intensity per GDP Yuan in 2020 will be 60 percent of that in 2005. The projected Business-As-Usual (BAU) Chinese emissions in 2020 will be 22,864 million tons, roughly 3.5 times than that of 2006. However, due to the advancement on technology and economic structure, the actual CO2 intensity per GDP Yuan might be lower than that of 2005 in a range somewhere between 13,718 million tons and 22,864 million tons. The GDP calculation of this projection is based on RMB Yuan since there was an exchange rate adjustment between US dollar and RMB Yuan in period of 2005 to 2008. In addition, it is rather complicated if there is a further exchange rate movement up to 2020. Therefore, the method by using per GDP US dollar to measure CO2 intensity may not be effective one under this situation. In a nut shell, as a result of China’s solution on Climate Change, China might avoid to emit at most 9,000 million tons of CO2 into the atmosphere in 2020 if Chinese economy can keep the annual average of GDP growth at 6 percent from 2013 to 2020. Unfortunately, the result of this projection is seemed not very promising on our human’s collective effort to reduce the aggregate CO2 emissions worldwide. In any case, this is likely the best realistic approach to address the dilemma between economic growth and Climate Change for developing countries. As Rome is not built on one day, the accumulation of CO2 concentration in atmosphere has start almost a century ago, we certainly cannot expect we could solve the problem within a decade or two, the time scale we might need is probably half a century or even longer. Yuan is the China’s official currency, also known as RMB Yuan. According to Yahoo Finance, the official exchange rate of USD to Chinese Yuan is 1 to 6.83 in December 4, 2009. CO2 intensity per GDP Yuan = the amount of CO2 emission/ GDP Yuan  It is roughly equal to US $ 9,368 billion, two thirds of the U.S. GDP in 2008 according to the official exchange rate in December 4 of 2009 from Yahoo Finance.